Ugly Bag Of Mostly Water and his concubine were in the region, and The Back Abbey was a convenient spot to convene. We had heard plenty of hype regarding this burger, and what better way to test the veracity of those claims but to show up in force. As I waited for my friend to arrive, I spoke at length with The Back Abbey's GM, Erik. Erik was very knowledgeable about the cheeseburger, and he was most helpful in helping me to understand the details associated with its preparation. One of the coolest things about The Back Abbey was that it served schnitzel in the guise of a salad. Fried pork with a smattering of greens--Magic! Natchy, we ordered this "salad" and some cheeseburgers (The Backyard). Our meals arrived in about ten minutes. The Beef: Kaboom! The beef arrived pre-ground, courtesy of Premiere Meat Company. The beef was ground daily at 4:00 AM. The 6-ounce burgers were comprised of a proprietary blend of Chuck and a selection of dry-aged cuts, which delivered a well-rounded bite. 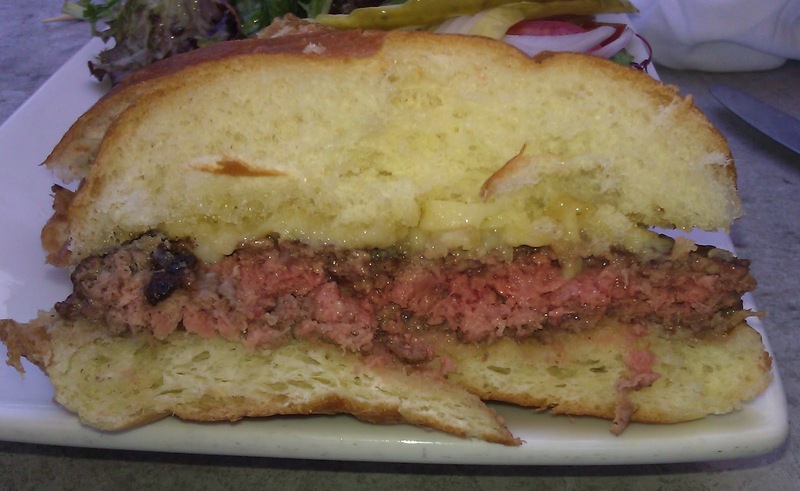 The burgers were potently beefy, moderately juicy, and they carried a medium level of dry-aged funk. This funk carried throughout the bite, and it was most satisfying. The grind was coarse, and this made for a hearty, steak-filled mouth feel. It was fun to chew on the coarse bits of flavorful steak that lingered on the tongue. The fat content hovered around 20%. The most notable mineral flavor that came through was iron. 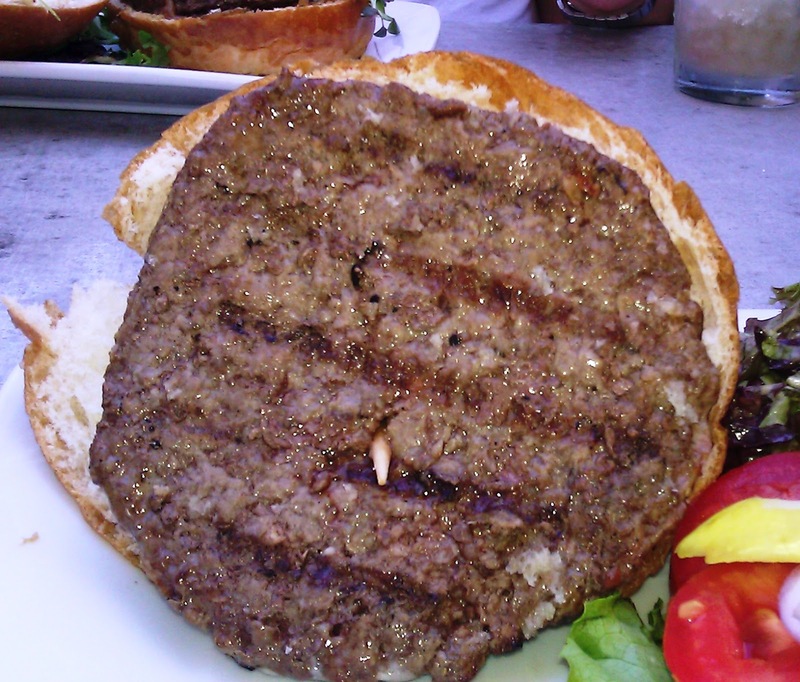 This was due to both the blood in the beef and the clean, cast iron grates upon which the burgers were grilled. All told, the burger meat was excellent and well-balanced at The Back Abbey. The Seasoning: Salt and pepper were employed in just the right amounts. The seasoning perfectly enhanced the beef, funk, and steak flavors of the delicious burger meat. The Sear: This was completely lacking. When I first saw this, I assumed that I would be sending my burger back. UBOMW had already taken a bite of his, and he urged me to not jump to conclusions. He was correct. While I remain convinced that a crisp sear would have put the excellent beef over the top, the sear was not missed as much as I thought it would have been. The burger meat was just that good. The Preparation: The Back Abbey grilled our burger patties on a moderately hot, gas-fired grill. The burgers were turned only once during the cooking process, and this was appropriate. The uniform patties were formed during morning prep by gently pressing the freshly ground beef into circular molds. The burgers were cooked to Med-Rare as per our request. The Cheese: YES! The one-year aged, white cheddar was shredded and perfectly melted over the burger patty. The cheddar was fantastic. It was salty, creamy, tangy, and it contributed just enough umami to fill in the bite. The bite of the cheddar mostly compensated for the lack of sear. The Bun: It was tricky to figure out where the bun came from--Erik was not forthcoming with that detail. However, as I waited for my friends, The Back Abbey took in a delivery of fresh buns. I caught the attention of the driver on the way out and discovered that the buns came in from the L' Artisan Vally Baking Company in Thousand Palms, CA. This was the only bakery that would prepare a brioche to the exacting standards of The Back Abbey. The brioche was fresh, sweet, and buttery. Really buttery...butter wafted from the bun as one bit into it. The bun was not toasted. A little crispness would have been nice, but it, like the sear, was not sorely missed. The Toppings: The Roma tomato slices were ripe and rich. The Romaine lettuce leaf was a day past its prime with noticeable oxidation along the ribs and cut ends. The Fries: The fries were an extra $8 for a full order, and they were sort of worth it. 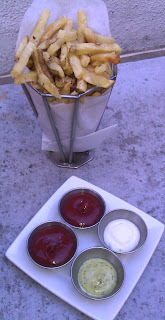 The house-cut, peel-off, standard fries were first cooked in duck fat. The fries were finished in soy oil. The result was a richly flavored, crisp, blonde french fry. The fries were crisp and perfectly seasoned. The Value: The Backyard Burger at The Back Abbey was $11. Considering the quality of the meat, bun, and cheese. The burger was correctly priced. 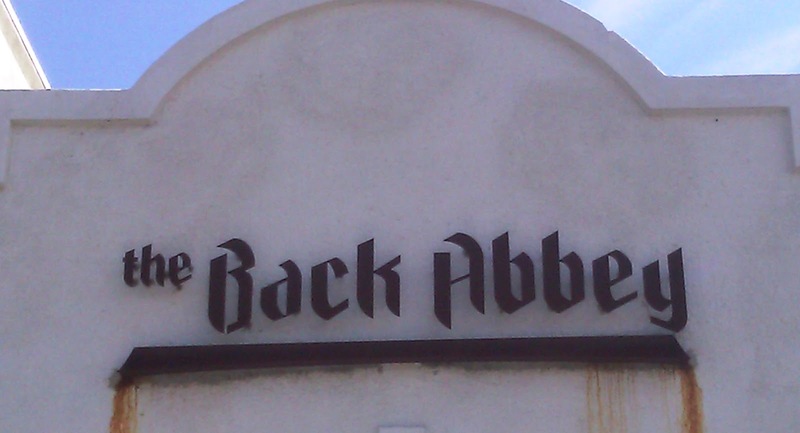 Did The Back Abbey live up to the hype? Yes, yes it did. The Back Abbey delivered a pretty amazing burger. The meat and bun were both carefully crafted and guarded recipes. The cheese was spot on. The balance of flavors was perfect. The only thing that I found lacking was a shift in texture that should have come from the crispness from the sear or toasting of the bun. 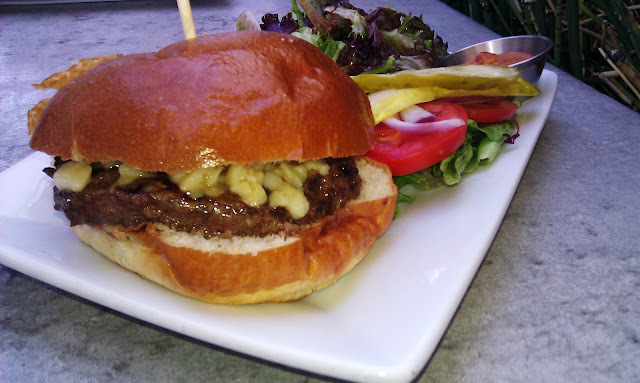 Burger Review : The Back Abbey delivered a really remarkable burger composed of remarkable ingredients.